Denham / Benn have tabled proposals to convert Ayr’s B-listed Strathdoon House off Racecourse Road into 14 homes under plans being driven by Maramac Ltd. Situated within a conservation area the Georgian villa was last in use as an NHS clinic prior to falling into disuse in 2010. 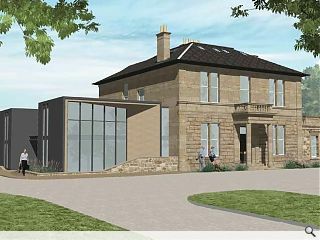 Now under new ownership it is proposed to return the building to residential use with the help of a contemporary extension. The proposed solution entails formation of a vehicle-free shared courtyard framed by a repurposed and extended service wing to provide modern mews accommodation together with the villa itself and a pavilion extension. Planned extensions will be finished in buff coloured render to match existing stonework with the mews extension utilizing a natural slate roof to match the existing wing and a glass ‘disconnect’ used to link a new pavilion to the villa.